And then I began to understand that no one in this life is looking to be “tolerated.” Because, you see, to tolerate means to “allow the existence, occurrence, or practice of (something that one does not necessarily like or agree with) without interference.” No human being should have as their goal being allowed to exist despite, well, anything. So I began to change my language. I began to say that awareness leads to understanding and understanding leads to acceptance. Because acceptance means “the action or process of being received as adequate or suitable, typically to be admitted into a group,” and wasn’t that what we were going for? Being included? Welcomed? Valued? Awareness –> Understanding –> Value –> Support –> Celebration. And this is what it looks like. On Tuesday night, we went to my cousin’s wedding celebration. As soon as Brooke saw the dance floor, she announced that she was going to “dance on the stage.” Never mind that the music playing was soft dinner music and not dancing music. Never mind that everyone else was seated and no one was on the floor. Never mind that it’s just, ya know, not what people do. My kid was not to be deterred. She hit the floor and danced. She did ballet. She skittered across the floor on her toes and twirled with her arms over her head. She squealed with delight as she ran on her tiptoes, then put her palms together and bowed into a deep plie. She was deliriously happy. I glanced at the next table and saw my cousin, my grown-man, brother-of-the-groom cousin, watching her and wiping away tears. Ever so briefly, he caught me watching him watch her. We smiled at each other, then looked away just as fast – the emotion was too much. Later, he would tell me how moved he was watching her dance. How he understood that the movement quieted the noise for her. That her freedom in being who she was was one of the most incredible things he’d ever seen. That he envied her that freedom. 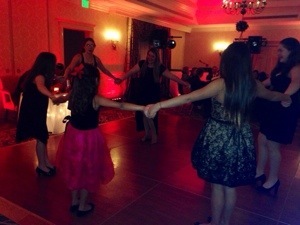 A few minutes later, the band of cousins would all march to the dance floor together. They would ask Brooke if they could join her. They would form a circle and, knowing her very favorite thing in all the world, ask if she wanted to play follow the leader. Six of them would follow my girl’s lead. And this is what it would look like when they did. You may need to click on the photo above in order to see Brooke. (She’s in the middle.) It’s worth it. 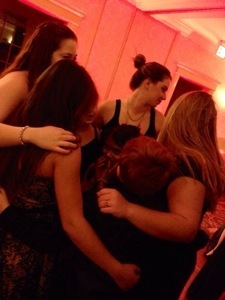 She inserted herself into the center of the cousin hug. I can’t imagine any other scenario in which my child would happily be in the middle of a closed group of people. I don’t know how to convey just how extraordinary this is, or just how much it speaks to the immense trust she has for her extended family. You’ll just have to take my word for it. Credit for the one above goes to Luau, who was kind enough to stand on a chair to take it when his wife was shouting at him, “Get on a chair! Get on a chair! We HAVE to get this shot!” He’s kinda awesome like that. This, my friends, is what the formula looks like. It looks like what I wish for the bride and groom – A life in which they value and support one another. A life lived as an unabashed celebration — of each other and of the life that they will create together. A life of freedom to be themselves. A life of laughter and fun. A life of love. Because truly, what I wish for my daughter is what I wish for us all. And it’s a lot more than being tolerated. Huge thanks to my family for .. well, all of it. The very least being use of the photos, but I appreciate that too. I love you guys dearly and I am so grateful that you’re mine. You started my day with joy and awe. 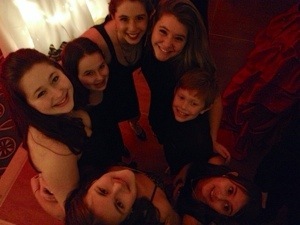 I’m so happy for Brooke that she has that wonderful group of cousins. 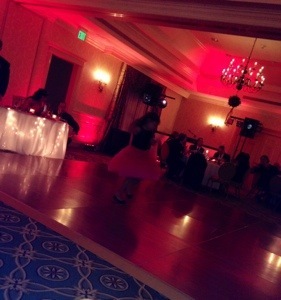 I’m also thrilled that she has the capacity to dance as though no one is watching. It’s 3:48, west coast time. I am up because I am vomiting. Then bathing because I got vomit on myself (sorry, TMI). But I’m really thankful that I am up. Because I got to read this at the beginning of my day instead of the end like I usually do. These words just made me thankful that has to throw up. THAT’S how beautiful I think they are. That is a very weird complement I know, but please understand (and forgive) what I am trying to say. It’s such a BIG idea and now I too will make the leap from saying accepted to celebrated and (dare I say it?) wanted. 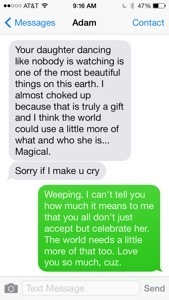 Thank you for making me weep happy tears, and sharing this story, and turning my day around. sadly, i totally get this. lol. hope you feel better!!! You truly are blessed to have a family that not only celebrates Brooke, but also supports and Celebrates you! I used to know how to dance like nobody’s watching. I learned how to become acceptable. I need to unlearn that and learn how to dance again. My son often dances as if no one is watching…I wish I could be more like him and Brooke. And your post made me cry…because if these young people get it…there is so much hope that so many others will, too. You have a wonderfully supportive family. Thank you for sharing this with us. Awareness is great. Thank goodness there’s more of it – that Rain Man isn’t the only thing that comes to mind when people think of autistm. We have Temple Grandin, Daryll Hannah, Dan Akroyd, Susan Boyle. But awareness isn’t enough. Acceptance, on a general social level is “OK”, but on a personal level – it’s still not enough. The author shows her journey – and her ideal: Awareness –> Understanding –> Value –> Support –> Celebration. I love this – now as a parent, I’m gonna celebrate my kid (don’t worry, I don’t expect anyone else to do it like I do, LOL). But we can all certainly strive to understand/value/support each other through our journey in this world together. In tears. Again. I love this. I love your family. It may not be easy for some/most people to find this within their own families–but I will say it again, we can build this with friends who become family. I LOVE every bit of this post. Sadly, the first thing I thought of… my family would be mad that my son was center stage and shouldn’t be on a day that is meant for the bride and groom. Or that this isn’t a time for dancing, you should be sitting. Your family totally embraced her and absorbed all of Brooke’s magic. I have some work to do on my continual education of the ones closest to us as well as opening hearts and minds into being more than ok with doing what feels right in the moment (no matter the time or place). Also, thanks for always challenging my language. I’ve used “acceptance” for a while now and I’ve thought it isn’t enough but I didn’t push myself to discovery what is. Supportive family is everything. We are lucky that way too. So happy for all of you! What a beautiful formula and what an incredible moment to share! I would love for people understand, value, support and celebrate my son as well. Your post brought me to tears…..beautiful! LOVE LOVE LOVE LOVE this! I’m glad you posted this on your Facebook page again, otherwise I’d not have seen it. I’m so pleased to see so many people writing along these lines now. I want so much more than awareness or tolerance for my kids. When I was looking at your new posts about Zazzle shirts, I was reminded of this post. Will you please make your above formula into a shirt? I wanted to write something for world autism awareness day, but this piece is exquisitely perfect. I couldn’t possibly add more.